Assassins Creed Movie Replicas for sale. 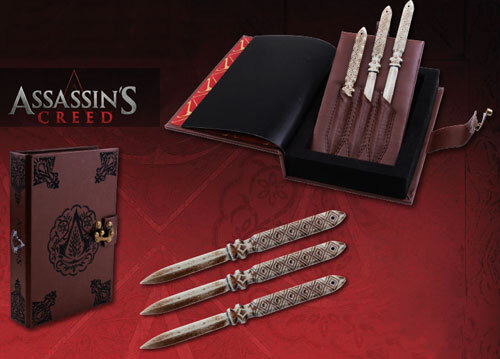 Buy the officially licensed Assassin's Creed Hidden Blade of Auilar Extension Knife Vambrace, Sword of Odeja, and Aguilar's Throwing Knife Set with book display. These are the officially licensed replicas from the popular video game series and Assassin's Creed movie. 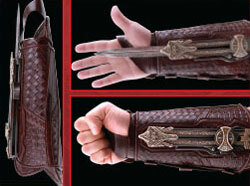 Assassins Creed Hidden Blade of Aguilar is an officially licensed replica from the movie. This brown leather vambrace features a woven pattern on the top and the hidden blade of Aguilar underneath it. The interior has two Velcro straps to secure it to the arm and a strap for the right hand. The unsharpened stainless steel blade can be extended by sliding the blade release on the side. The blade extends out to 5 inches. It is engraved with an acid etched pattern and features a pointed tip. These extension knives also include a Certificate of Authenticity. These items are not a toy. They should be handled with care. The tip is pointed and can cause harm. Buy the Hidden Blade of Aguilar from the movie Assassin’s Creed for $79.99. Sword of Odeja for sale is 43 ¼ inches in all. 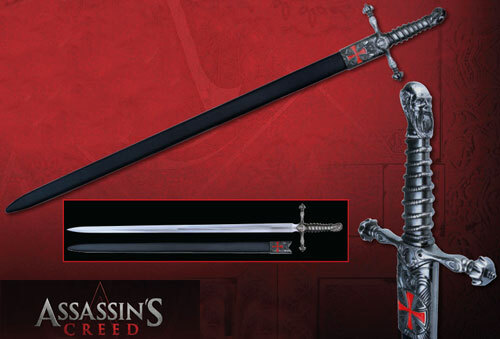 The Sword of Odeja is an officially licensed sword from the Assassin’s Creed movie. They feature a display ready, unsharpened stainless steel blade. They have a molded zinc alloy handle with a face on the pommel. The scabbard is covered in faux leather and engraved with the famous red cross. These swords include a certificate of authenticity. Buy the Sword of Odeja from the movie Assassin’s Creed for $119.99. Assassin's Creed Movie Aguilar Throwing Knives for sale are not sharpened and measure 6.25 inches in all. 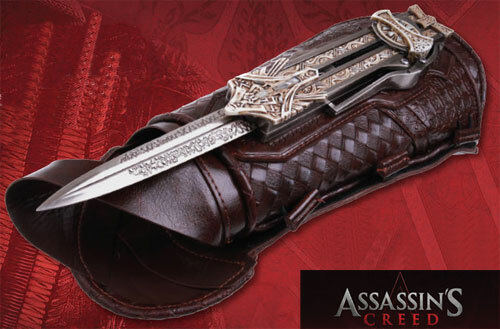 The officially licensed Aguilar Throwing Knife Set is from the Assassin’s Creed movie and includes three knives and a storage box. The unsharpened throwing knives are stainless steel with an ivory color finish. This set includes an 8 inch by 5.5 inch faux leather journal storage box and a certificate of authenticity. Buy the officially licensed Aguilar Throwing Knife Set for $49.99.